It’s unfortunate that one of the key linchpins for retention, succession and development is often overlooked, undervalued or ignored entirely. In the absence of practical and engaging development plans, clarity about what motivates your talent, what opportunities they really want and the gaps they need to close to get them there remain a mystery. 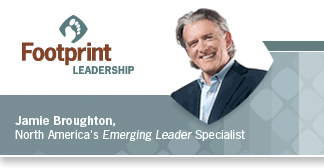 Without creating a compelling future at your organization and headhunters calling regularly, firms are exposed to flight-risk and are flying-blind when it comes to succession. But there’s a problem of course: it’s never urgent enough. As a result, the whole development exercise often becomes a check-the-box, just-get-it-out-the-door exercise for all. So much like King Sisyphus condemned to eternally roll a boulder up the hill, Talent Management professionals suffer a similar fate in this world of development planning. They dutifully provide careers tools and then chase managers to do reviews and employees to fill in their plans only to be left with underwhelming participation rates and cut-and-paste documents that are often unclear or have little practical or strategic value. 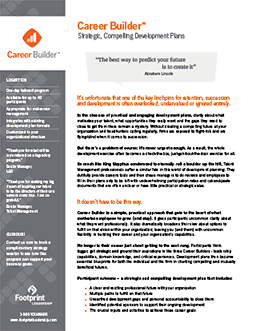 Career Builder is a simple, practical approach that gets to the heart of what motivates employees to grow (and stay). It gives participants uncommon clarity about what they want professionally. It also dramatically broadens their view about options to fulfill on that vision within your organization; leaving you (and them) with uncommon flexibility in building their career and your organization’s capabilities. No longer is their career just about getting to the next rung. Participants think bigger, get strategic and ground their aspirations in the three Career Builders - leadership capabilities, domain knowledge, and critical experiences. Development plans then become essential blueprints for both the individual and the firm in charting compelling and mutually beneficial futures.